Tree peonies are all lovely, with a sparse structure of strong stems, clothed in summer with multiply divided leaves. 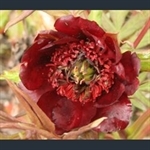 But they come in two kinds: Paeonia delavayi, a Chinese species, is a refined plant, with modest sized flowers, usually bright yellow or the deepest maroon, while Paeonia suffruticosa and P. rockii have huge blousy flowers, often in the case of the hybrids without the slightest hint of good taste. You love them or hate them! Tree peony with nodding, dark red flowers. Tree peony with bright yellow flowers.